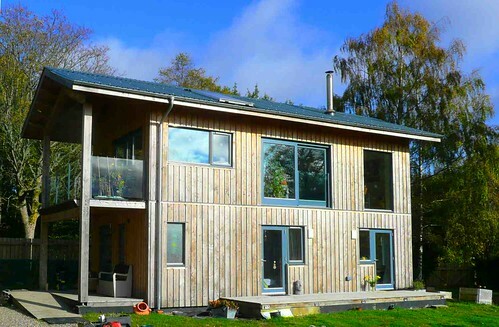 This self build, passive solar, larch clad timber frame house has recently been completed. It is highly glazed on the south elevation and has a concrete floor slab for thermal massthis is about how much heat something can absorb - so it involves its specific heat capacity and its volume. It can be useful for levelling out the peaks and troughs of temperature within a house. See the page on thermal mass. It has high levels of cellulose insulation (Warmcell). Heating is by an air source heat pump in conjunction with a solar panel, feeding into a water heat store which then serves the underfloor heating. Backup is from a wood burning stove. The 74 m² house has two bedrooms which are on the ground floor and has been designed so that it can be extended at a later date. See Lifetime homes"Lifetime Homes make life as easy as possible for as long as possible because they are thoughtfully designed. They provide accessible and adaptable accommodation for everyone, from young families to older people and individuals with a temporary or permanent physical impairment". See the Lifetime Homes page and the Lifetime Homes Foundation web site. The roof cladding is interesting, being Marley Eternit profiled fibre cement sheeting more often used on agricultural buildings. It is economical and has low embodied energythe total amount of energy it takes to make a material (or a building). See more on embodied energy. The roof has generous overhangs to protect the exposed timber. The gutters are by Lindab.